Using the Parallels HTML5 Client. The HTML5 Client is a RAS client application that runs inside a web browser. End users can use Parallels HTML5 Client to view, launch, and work with remote applications and desktop in a web browser. The Parallels HTML5 Client does not require end users to install additional software on their computers, therefore it is not platform-specific. The only requirement to use Parallels HTML5 Client is an HTML5-enabled web browser that must be installed on a client computer. [Hostname] : Is the hostname of the computer where a Parallels RAS Secure Client Gateway is running. The RASHTML5Gateway part must be used as-is. The complete URL can be obtained in the RAS Console by navigating to Farm / Site / Gateways. Right-click a RAS Secure Client Gateway and click Properties, then click the HTML5 tab and copy the URL from the URL field. When you open the URL in a web browser, the login page is displayed. Specify the user name and password and click Login. Install Parallels Client: This option, opens the Parallels Client download and installation page. Follow the instructions and install Parallels Client. After the installation, you should see Parallels HTML5 Client displaying published resources that you can use. Please also note a link that should appear in the lower left corner of the screen displaying the Parallels Client version and build number. You can now run remote applications and desktop in Parallels Client or in a browser (HTML5). The default method for running applications and desktops is Parallels Client. To run a resource in a browser, right-click it and choose Parallels HTML5 Client. Open in Parallels HTML5 Client. This option, closes the dialog box and opens the main Parallels HTML5 Client screen. Remote applications or desktops will be launched in the web browser. When you open Parallels HTML5 Client the next time, you will again see the dialog box with the same options. Always open in Parallels HTML5 Client. This option works similarly to the option above, but this selection is remembered the next time you open Parallels HTML5 Client. You will have to select one of the above options or the same dialog will be presented again. Launch apps in Parallels Client Once this option is configured on the server side, one will see a dialog box prompting to install Parallels Client. Click the link provided to open the Parallels Client download and installation page and follow the instructions. After you install Parallels Client, the main Parallels HTML5 Client screen opens displaying published resources that you can use. If you now double-click a resource, it will be launched in Parallels Client. Launch apps in browser only (HTML5 only) With this option configured, the main Parallels HTML5 Client screen opens with no additional prompts. Remote applications and desktops will be launched in the browser. Double-click an application or a desktop. The resource will open inside a browser or in Parallels Client depending on the server-side configuration. Right-click an application or a desktop to display a context menu. Depending on the server-side configuration, the menu will have an option to open the resource in Parallels Client and/or Parallels HTML5 Client (if both methods are allowed, there will be two corresponding menu options). You can add a remote application or a desktop to the Favorites list, so you can easily find them. To do so, point to an application or a desktop and click the star icon. To view the list, click the star icon on the toolbar in the upper-right (next to the Search box). To remove a resource from the list, point to it in the list and click the "X" icon. To search for a resource, begin typing its name in the Search box on the toolbar. The list will be filtered as you type to contain only the resources with matching names. To view a resource description, position the mouse pointer over it. The description will appear as a tooltip. This could be helpful if one or more resources are published using the same name. By reading the description, you can distinguish between them. When you launch a remote application or a desktop, it's icon is added to the taskbar at the bottom of the screen. When the taskbar is full, items of the same type are grouped to save space. You can click on a group to see the list of all running instances and to switch to or close a particular instance. Sound. To play the sound on the local computer, select the Bring to this computer option. If sound is not supported by your browser, the menu will be disabled and you'll see a corresponding text message below it. Redirect links. Select a desired redirection option from the following: Do no redirect, Redirect URLs, Redirect email, Redirect all. When a redirection is enabled, a link will be opened on the local computer. Redirect printers. Select a printer redirection option: RAS Universal Printer (uses the RAS Universal Printing technology) or Do not redirect (printers will not be redirected). Keyboard Compatibility Mode. Enables the keyboard compatibility mode.You should use this mode ONLY if a remote application doesn't interpret some of the keystrokes correctly. Such applications are rare, so this option should be normally disabled. Change Password: Allows you to remotely change your domain password. 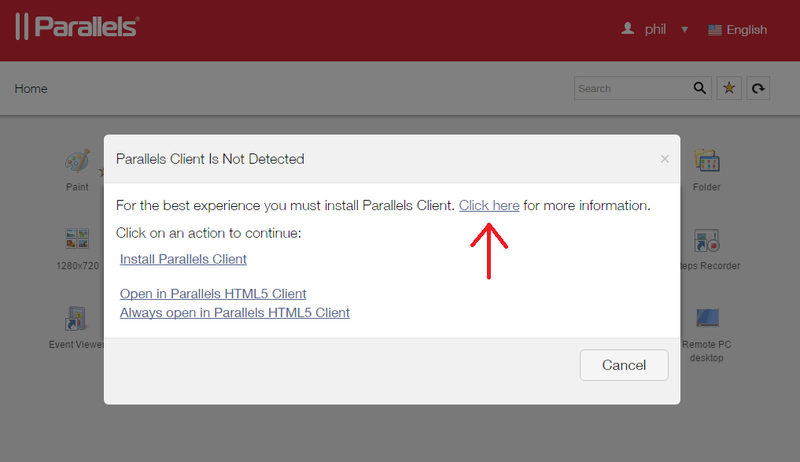 Download Client: Click this option to open a web page with instruction on how to download and install Parallels Client. You can also download Parallels Client by clicking the Parallels Client not installed link in the lower left corner of the web page. The link opens an information box where you can click the Install Parallels Client link to open the download and installation instructions page. Logout: Ends your session with RAS.